Variation is becoming more problematic as chips become increasingly heterogeneous and as they are used in new applications and different locations, sparking concerns about how to solve these issues and what the full impact will be. In the past, variation in semiconductors was considered a foundry issue, typically at the most advanced process node, and largely ignored by most companies. New processes came online every couple of years, and foundries had to figure out how to correlate what got manufactured with the original spec, which was mostly dealt with in the process rule deck. But enough chips are being built far enough down the process roadmap, for markets such as automotive or anything involving AI, that these issues are no longer someone else’s problem. As chips are added into a slew of new markets, the number of sources of variation are increasing. There is variation in the processes, the manufacturing tools, the analog circuitry, and even in use cases and environmental conditions. And to make matters worse, these are all additive. 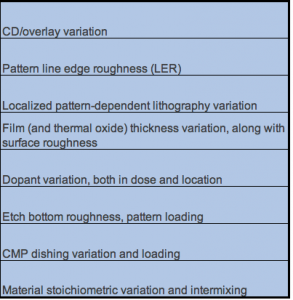 So while one type of variation may not interrupt the functionality of a chip, or turn a die from good to bad, variation across multiple manufacturing steps, use cases, or across multiple dies that need to work together can render entire systems unacceptable. And in the case of automotive, industrial or medical devices, those inconsistencies could have life-threatening consequences. On top of that, the number of sources of variation are growing. Combine that with tighter tolerances and less room for guard-banding, and variation becomes much more of a critical element from design through manufacturing. 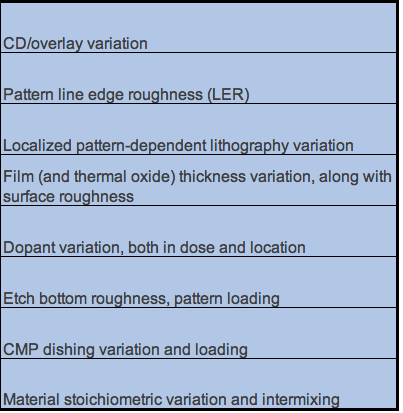 Variation extends to all parts of the manufacturing flow, and while it is present even at 28nm and 22nm, the problem becomes more acute as feature sizes shrink beyond the capabilities of fab equipment. For the better part of a decade, the big challenge was being able to print fine enough features quickly enough. That problem is now somewhat under control with EUV, which currently is being used by both Samsung and TSMC. But other equipment is running out of steam, too, in areas such as inspection, metrology and test, which makes spotting variation across an increasing number of potential trouble spots more difficult. One area that continues to be particularly problematic is edge placement error, where photomasks need to be aligned to print extremely tiny features. This requires complex coordination of many parties in a chain of exchanges, specifications and permissible tolerances and error budgets. In the past, some of this used to be controlled by the now-defunct International Technology Roadmap for Semiconductors (ITRS), which served as a central authority for handing out error budgets and tolerances for future generations so that all equipment suppliers are coordinated to assure reliable manufacturing of future nodes. How this figures into future generations of chips remains to be seen. From a manufacturing standpoint, that still leaves plenty of variation issues to resolve. But even without extending scaling, variation is starting to creep into chips from new sources. Sometimes, solving variation issues in one area can result in unexpected variation in another. The problem isn’t just confined to manufacturing. It’s showing up all the way across the supply chain, from initial design all the way through to materials, equipment, manufacturing and final test. This affects every piece of the design puzzle, from floor planning to design for manufacturing (DFM) models and tooling. The use of finFETs at 16/14nm to control leakage current added much more regular shapes into designs, limiting freedom for design teams and therefore some of the variation caused by different shapes. Whether that solves the growing variation problems across the industry remains to be seen, but chipmakers are beginning to discuss this problem at a number of conferences. Tighter tolerances, new applications and widely different use cases are adding to variation concerns across the supply chain. What used to be almost exclusively a manufacturing problem is rapidly becoming a manufacturing and design problem. This is both a challenge and an opportunity, and there is no shortage of activity behind the scenes to understand and resolve this issue. But at this point, there’s still a lot of work to do. — Brian Bailey contributed to this report.